The Secotan formed part of the group known as the Carolina Algonquians. They spoke the now-extinct Carolina Algonquian dialect, and inhabited the Albermarle and Pamlico sounds in the 1580s. It has been suggested that the Secotan later merged with the Machapunga, or were adopted by them. John Swanton writes that the name 'Secotan' may have been a village name within the Machapunga, which appears to concur with the putative connection. One occasionally comes across the name 'Secotaooc', the '-ooc' suffix referring to shellfish and a large expanse of water, the suggestion being that this is merely a variation, as indeed is 'Secotaoc'. However, C Wingate Reed in Beaufort Country: Two Centuries of Its History (1962) is of the opinion that 'Secotan' and 'Secotaoc' being two distinct towns. Could the Roanoke settlers have joined up with the Chesapeake Indians? One of the Secotan sub-tribes - the Dasamonguepeuc - had their main settlement near Mann's Harbour, North Carolina, washing into the Croatan Sound. Early maps put Dasamonguepeuc on the opposite shore to Roanoke Island. When Governor John White returned to Roanoke in 1587 and found no trace of the fifteen men who had been settled there two years earlier, save for some bones, he made friends with local friendly natives who were led by Chief Manteo. The chief, and his associate Wanchese, had accompanied Amadas and Barlowe to England in 1584, returning later. 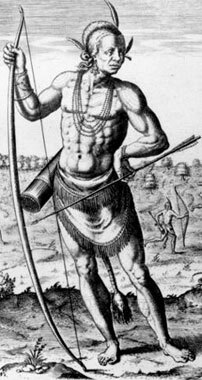 Manteo informed White that the missing colonists had died at the hands of hostile Secotan, Aquascogoc, and Dasamonguepeuc warriors, in what may be assumed to have been an ambush, as the time and place of the attack was 'of great advantage to the savages' (see the Roanoke feature for full details). The English created Chief Manteo the first peer in North America. He was granted the title of baron, the Lord of Roanoke and Dasamonguepeuc.